If you've ever had a chance to enter a Disney Theme Park prior to opening, say for an early dining reservation or special tour, you know how magical it can be. There's something about seeing the parks without all the congestion and foot traffic. It can also be a great time to take some photos without other guests in them! At Disney's California Adventure Park, guests can make reservations for a secret 2-mile walking tour of the Theme Park. The tour is led by a Cast Member who also provides some trivia and Disneyland Resort history. This tour is available to any Disneyland Resort hotel guest - but just remember that advance dining reservations are required. To make a reservation, stop by Guest Services. O have some exciting news to share with you about the Disneyland Resort in California. For the first time in almost two decades, Disney will open a new Four Diamond hotel! Set to open in 2021, this hotel will transform the west end of the Downtown Disney District and anchor a new gateway to the Disneyland Resort. The stunning 700-room hotel will feature a sophisticated design, extensive landscaping and water elements that will create a resort oasis, showcasing nature on every level of the hotel. The hotel’s location embraces the iconic Disneyland Monorail with a dedicated platform inside the hotel for direct transport into Disneyland Park. The ground level of the hotel will include shops and restaurants opening onto an expansive landscaped plaza complete with playful water features, creating a gathering place for guests and visitors. The new hotel also connects all four Hotels of the Disneyland Resort through lush gardens and beautifully landscaped walkways, transforming the gateway on the west side and creating a welcoming entry. On June 1, 2017, the classic Space Mountain returns to Disneyland Park. Just days after we mark the 40th anniversary of this Tomorrowland favorite, space travelers will blast off once again for their intergalactic adventure. You are clear for launch starting June 1, 2017 with the return of Space Mountain at Disneyland Park! Today I have a first look at The Collector’s Fortress at Disney's California Adventure Park. This enigmatic building is home to the soon-to-be-unveiled Tivan Collection, where you will get to view the rare items in Taneleer Tivan’s extensive holdings, including his newest acquisitions: the Guardians of the Galaxy. You can explore The Collector’s Fortress firsthand when Guardians of the Galaxy - Mission: BREAKOUT! opens May 27, 2017 at Disney California Adventure Park. The fortress shimmers with colorful and sparkling details; pipes cross and climb the exterior, carrying the organic matter the Tivan Group has mined to power the massive generator that powers the entire building, keeping every cage locked and the valuable collection secure. Rising and falling gantry lifts peek out of doors exposed through the corroded, burnt metal, and it even looks as if the structure may have taken laser fire and blasts. 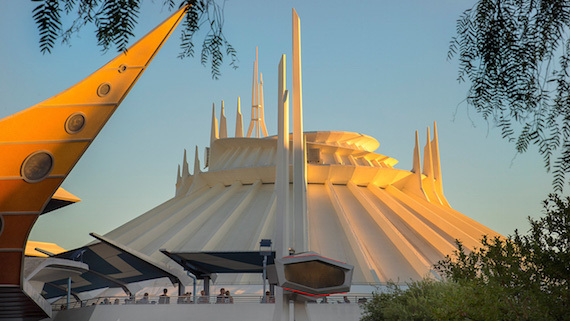 Exciting details about the Star Wars-themed lands planned for the Disneyland and Walt Disney World Resorts were shared on the “Wonderful World of Disney: Disneyland 60” special that recently aired on ABC. Soon you'll be able to step aboard The Millennium Falcon and actually pilot the fastest ship in the galaxy, steering the vessel through space, firing the laser cannons, in complete control of the experience. At 14 acres each, these richly detailed lands promise to immerse you in the Star Wars galaxy as never before, allowing you to create your own adventure. Stay tuned to Save at WDW for more details about all the excitement coming to Disney Parks, the place where Star Wars lives. Instead of collecting Disney PhotoPass Cards during your visit, you can now link cards to your account by entering the 16-character PhotoPass ID or by using the QR code scanner available in the app. You can also link attractions by enter the 8-character ID found on the preview monitor at the exit of a participating attraction. You can also view your memories and purchase them in the Disneyland App! You can purchase an individual photo, or download all your photos captured during a one-day visit to Disneyland Resort, and linked to your account, for $39 with Disney PhotoPass+ One Day. If you have an Annual Passport that includes Disney PhotoPass downloads, you can link your pass to your account so you can download and share your photos using the Disneyland App too! The Rivers of America and the Disneyland Railroad at Disneyland Park are temporarily closed as Walt Disney Imagineers prepare to make room for the all-new Star Wars-themed land. When these areas reopen, the north bank of the Rivers of America will feature a beautiful new waterfront. The new riverbank will also include an elevated trestle over which the Disneyland Railroad will travel. Take a look at this Walt Disney Imagineering artist rendering for a sneak peek!